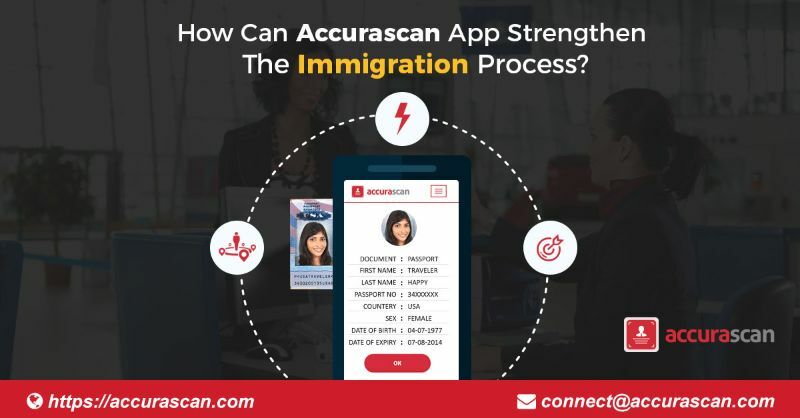 How Can Accurascan App Strengthen The Immigration Process? The quote by Timothy Murphy, the famed Irish American who turned the tide of the American Revolutionary War underlines the significance of the immigration officers who work extremely hard to thwart any attempts of illegal migration. These officers are usually posted at checkpoints and screen the people who are attempting to enter in their nation. To carry out their duties, they have to handle loads of documents on a daily basis and have a bunch of questions to ask from such people like the purpose of their trip, their occupation, duration of their stay, and more. For the screening of any person entering via the checkpoints which also include airports, they have to be always on their toes. They manually check the documents including passport, visa, hotel itineraries, and so on. This consumes much time. Such a scenario can undergo a remarkable change with the help of the Accurascan app. In fact, the app strengthens the immigration progress in more than a single way. Let’s find out how. Accurascan being an OCR scanning app extracts the text from documents within less than a second and that too with just a tap of their finger. Thus, it helps the immigration officers to have an excellent scanner installed on their mobile devices by which they can complete the screening process of more people in a given period of time. With the help of the Accura SDK, one can customize the scanning app to make it accurately scan all documents that are necessary for the screening of immigration in an effective way. Using such a scanner adds efficiency to the immigration process and leave no room for any human error due to fatigue or other reasons. The app currently scans several documents that are asked by immigration officers for clearance like passport, visa, ID cards, and more. Border checkpoints are not located always at swanky airport terminals. Some are also at places like highways and deserts with no or inconsistent internet connectivity. Since the Accurascan app works offline, immigration officers posted at these checkpoints can do the screening of people at a fast speed with high accuracy. The fact that they don’t have to carry any hand-held scanning device and can install the app by downloading it from the Google Play Stor or the App Store makes it a perfect tool. A tool to accelerate the immigration process with the revolutionary OCR technology. In an age of digitization where fast scanning and rapid digitization of documents can play a crucial role in strengthing an array of business processes, Accurascan app holds a lot of promise in strengthening the immigration process. To have a quick demo of the app, please download it from the Google Play Store or the App Store.